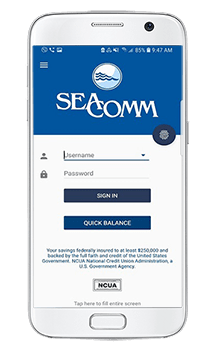 You can access your SeaComm accounts 24 hours a day, 7 days a week through your web-enabled cell phone or mobile device with Mobile Branch. 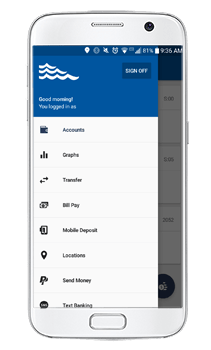 Easily access your account information, transfer funds or find a branch or ATM right in the palm of your hand. Sign up for the SeaComm NetTeller™ if you haven't already. 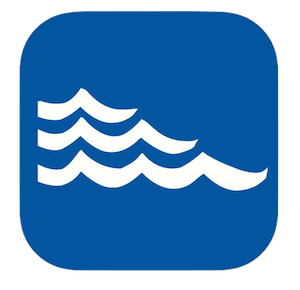 Using your web-enabled mobile device, download our app from the Google Play Store or the App Store. 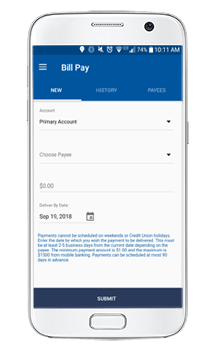 Gain access to your account information through Mobile Branch by logging in with your NetTeller™ credentials. 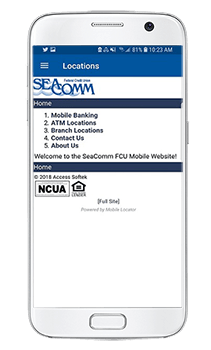 Download our SeaComm Mobile Banking app on the Apple App Store or get it on Google Play. Log in using your NetTeller™ username and password. You will receive a message to the email address we have on file for you. Please follow the steps in the email to complete the setup process. Once you've finished the setup process, you'll be able to set up your "Quick Balance" preferences, which will enable you to view your balance from this screen. For more details, click on the "Settings & Quick Balance" tab. PLEASE NOTE: You will need to set up your NetTeller™ access prior to logging in, if you haven't already. 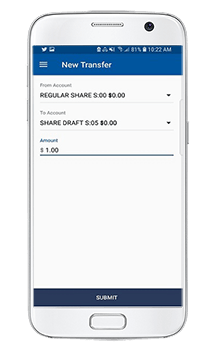 Once you're logged into Mobile Branch, you'll see a list of your accounts along with your available balance on each account, as shown in the image to the left. Below is a brief overview of each of these options. A comparison bar graph of your income and expenses. 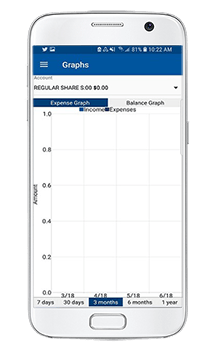 A balance graph that compares your income and expenses. View time periods that range from 7 days, 30 days, 3 months, 6 months and one year. Choose which account you wish to transfer your funds from. Select an account that you wish to transfer funds to. You can transfer funds to an account of your own or to another member's account or loan. Automatically transfer funds when you press submit.  Learn more about this service by clicking here. Simply enter your recipient's name, along with their email address or mobile number. Choose an amount and specify which account to withdraw the funds from. Select your payment type and press submit. An email or text is sent to the recipient to let them know their money is available. 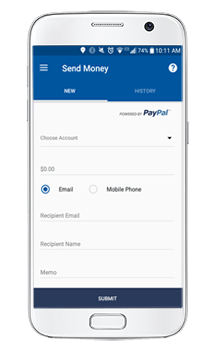 They will be able to log in, or sign up for PayPal to retrieve the payment. PLEASE NOTE: A fee of $1.00 will be charged for this type of transaction. Once you've signed up for text banking, you'll also have the option to set up text alerts. 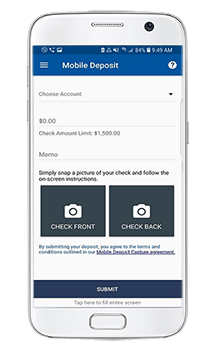 Text alerts can notify you when certain account activity happens, such as a change in your balance, or when your balance drops below a specified amount. You can also request to have an account summary texted to you daily. PLEASE NOTE: Message and data rates may apply depending on your service provider and data plan. 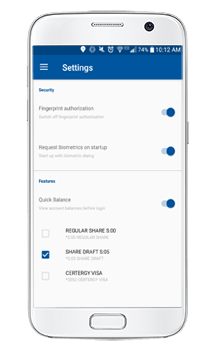 The "Settings" option at the bottom of the main menu will allow you to customize your security settings and make adjustments to the quick balance feature. Quick balance features allow you to view account balances on the login screen without entering your credentials. This can be turned on/off according to which accounts you want to make viewable. PLEASE NOTE: Some features are only available if supported by the device you're using. 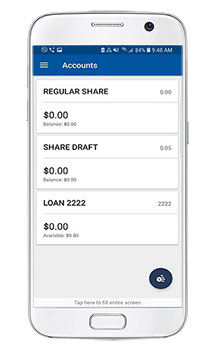 Our Mobile Banking system uses multi-factor authentication for user verification and SSL encryption to ensure data transfers are secure. 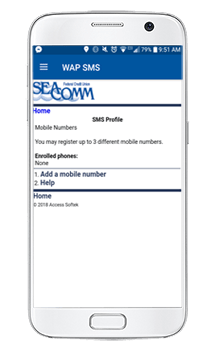 SeaComm Mobile Branch is free however you may be charged access rates depending on your carrier. Web access is needed to use Mobile Banking. Check with your service provider for details on specific fees and charges.